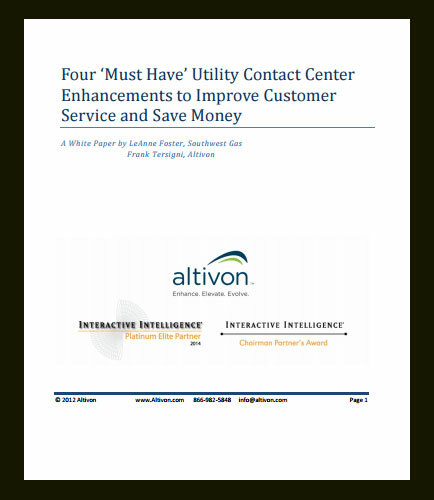 "Four 'Must Have' Utility Contact Center to Improve Customer Service"
There is a great opportunity to improve the performance and contribution of utility contact centers by making four “must have” changes. These changes are consistent with the latest industry trends and contact center developments, leveraging technology and best practices to deliver new levels of service. Call centers of all sizes and types are moving their call centers to the "cloud". In fact, many industry analysts predict that over 70 percent of call centers will use a hosted platform by 2014. Call center solutions are not a new business. For decades, call center executives have increased the productivity of their staff and ensured the call 'gets answered' with widely-supported, fully featured, equipment and software, such as phone systems, ACDs, reporting solutions, workforce management platforms and recording devices. When evaluating a new call center solution, agents and, more importantly, front-line supervisors are rightly focused on features that make their jobs easier or their time more efficient. However, the feature differences between most modern call center solutions are not significant. What is most important is if the solution can reliably route a call to the appropriate person, and the business can report on the activity to make staffing decisions. Business and customer service executives, are moving to the cloud not because of features, but for the inherent benefits of a cloud-based solution. What is Contact Center Infrastructure ?